To make the burger patties, season the meat and work the mince using your hands for about 5 minutes to make the meat more pliable, then shape into 2 patties. Cook in a pan until medium rare, 10-15 minutes. To make the roasted cherry tomatoes, mix all the ingredients together in an oven tray and roast for 10 minutes at 120°C. To make the caramelised onion, sauté the onion in a shallow, non-stick pan for 15–20 minutes. Add the sugar and vinegar and season. Cook for 2 minutes, or until caramelised. To make the roast onion cream cheese, slice the onion, then sauté until dark golden brown. Season and mix with the cream cheese. To make the chips, wash and cut the potatoes into chips. Blanch in lightly salted water with the white vinegar until soft but still firm, about 8–10 minutes. Place on sheets of kitchen paper and allow to dry. Heat the oil and fry the chips over a low heat until light golden. Remove from the oil and allow to rest for 5 minutes. Fry again on a higher heat until golden and crispy. 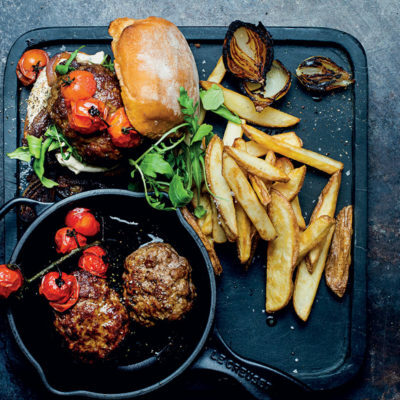 Assemble the burgers and serve with the chips. Cook's note: Virgin Kahn, head chef at Indochine at Delaire Graff in Stellenbosch, goes all out in the middle of the week. "This is my go-to burger when I'm home alone, with the kids at school and my wife at work. I spoil myself with an amazing burger, beer and a movie."